Should one company own 10 first page results for a commercial non-brand keyword? If you or I ever ranked this well and were that over the top with white-label domains we would expect a swift hand edit from the Google engineering department. Should Bankrate? Or is it ok for them to monopolize the search results if they already are a near monopoly? What is questionable here is not just the number of results or similarity of offering between different brands, but that a couple of the domains are the exact same names with the exception of one of them sporting a hyphen and the other going without. It is not like the competition is weak, with them outranking Fannie Mae, Yahoo! Finance, and Bloomberg. 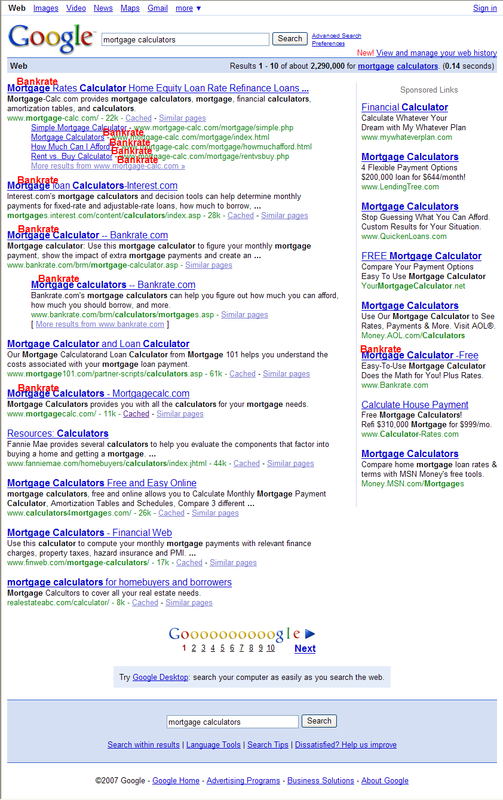 In a few months all those Bankrate sites will still rank because they have the AdWords budget and brand to support it. As a SEO consultor, I do like the fact that in 8th position in natural listing, Banrate did not got a good position, so they include their Ad in Sponsored listing in the same position (8th), very smart. Regarding the monopoly, it's absolutely normal, is you are a big company you have enough budget, to offer a high quality contents and high quatity sites, asn also the budget to pay SEO services. Google has always said how adwords advertising doesn't affect natural results but it seems clear here that it does have an affect. Even if they may not rank you higher it seems to allow you to get by with some non white hat techniques. I'd be curious to see more examples of this in action. I'm sure they exist. If they developed the strategy, did the work, provided the content, and came by the results honestly...then I don't see why it is technically wrong. I do agree that a normal person doing this would receive a smackdown. This is just a representation of a greater problem that every industry, market, or channel eventually encounters - getting engulfed by corporate America. Do you honestly believe that big business would allow for a medium where a blogger or tiny entrepreneur can gain an audience? When individuals with a website and a grudge (legitimate or not) can show up on the first page of the Google SERPs dissing a big company or a billion dollar industry...how long before that's shut down? When companies are willing to spend millions to make billions, they'll surely find ways (and allies) to overwhelm anybody telling the truth or giving free advice that they may otherwise pay for. What is that cluster under the first mortgage-calc.com listing? A whole bunch of other links from that site taking up valuable SERP real estate? How does one get that to happen anyway? Beautiful book you've created. I'm a musician but it's so easy to understand and apply for a lay man. Great work and I'm definitely going to apply all of what seobook says to increase my ranking on organic search when my site is up and running. Can you explain how Bankrate was able to do this? Are they gaming Google or are they using 'White Hat' techniques to dominate a very competitive niche? For us little guys, can you give us some tips on how we could compete with a company like this? The entire first page with the exception of just a couple listings were dominated by The Sci Fi Channel. They bought out the competition. Google lets them get away with it because they have a strong brand and a matching AdWords ad budget. How do you manage to get mutiple result for the 1st position ? My site is ranked no.1 for some high volume kw's but nevertheless when it appears in the first potion it shows only one link on not multiple ones like your site or bankrate. "I do agree that a normal person doing this would receive a smackdown." "For us little guys, can you give us some tips on how we could compete with a company like this?" When you say they have a 'matching AdWords budget', are you suggesting they have a HIGH AdWords budget? Is it because they're generating a lot of revenue for Google, that Google is giving them preferential treatment in the organic listings? Hasn't Google said that the organic and the paid are completely separate... like Church and State? This sounds like a major scandal! As a PPC consultant in the Travel industry we deal with large PPC budgets. I can confirm with 100% certainty that the Account reps , Team members and Strategists @ Adwords will try and tell and promise me all sorts of things true and false, just to get me to unnecessarily raise my cpc, one of them went as far as telling me not to pay attention to the quality score in the adwords interface, it wasn't the actual quality score! Another rep, went as far as to tell me that I better raise my bids because it would cause me to lower my quality score, I told her my QS was 'great' and had been so for 6-7 months, so she then told me that QS was factored into organic results! Obviously she didn't know what she was talking about! But the point is that , is there no end to the depths of depravity Google will attain in its quest. So much for do no evil!!! I'm still trying to get Google to look at one of the spammy results for a particular broad keyword (after 7 months of trying). The funny thing is that result #1, and result #2 are the exact same site - with different domains.. so much for duplicate content huh? All If have to say Is don't get mad at them for getting results whether it be spam or not. That would be great I will just add an additional $ 100K a month in ad spend to my adwords account and another couple hundred to my competitors annually. Sounds like what you get when you cross the mafia with a politician a mafiatician. I am glad there is no room for that in my niche market. If you want to easily dominate your niche for long tail then check out my post "Leveraging web 2.0 and authoritive domains to dominate search"
I've been involved in web design and Internet Marketing for a very long time. Anyone wanting to have any kind of long-term success in Internet Marketing has to become almost expert in SEO (Search Engine Optimization) and SEM (Search Engine Marketing).One of things that really bugs me as a bright, creative and well educated Marketing consultant . That's one of the biggest reasons why I'm taking the time to write this review, because if you read this book then you won't have that problem. Well, actually, I dont think that all of these web sites are owned by bankrate. Probably, theres something like an ad campaign and top ranked websites owners getting nice $$$ from bankrate or such for their websites (naturally grown?) positions. If you look at Bankrate's investors relations document the actually mention a couple of those site like Interest.com and one of their mortgage calculator websites. The other mortgage calculator site they own says Bankrate in the page footer. Google cares if you or I spam. It is an acceptable business practice if the likes of BankRate do it at an industrial scale though. Own a brand and you can build out a network of thin spammy sites and nepotistically cross link. See a site you like? Buy it. No big risks as long as your company is public.